TVS Motors has just put out a video teaser of its first-ever performance automatic scooter – the Graphite. First shown at the 2014 Indian Auto Expo as a ravishing concept, the Graphite will soon go into serial production. It’ll be unveiled on the 5th of February, days ahead of the 2018 Indian Auto Expo. The Graphite is speculated to pack in a 125cc four stroke engine good for 11.5 Bhp, and will rival the Honda Grazia and the upcoming Aprilia SR125. A CVT automatic gearbox is highly likely. It’ll be the fastest scooter TVS has ever built and is expected to reach speeds in excess of 100 Kph. The Graphite is sharply styled, and is expected to target younger scooter buyers in urban India. It’ll be TVS Motors’ flagship scooter, and will be the priciest in the line-up. The scooter is expected to get a slew of interesting design elements and features. A multifunction instrument cluster with in-built GPS is one such feature. DRLs are expected to be integrated into the headlamp while turn indicators get built into the cowl ahead of the handlebar. An external fuel filler cap is expected to make life easier. Like most 125cc scooters, the Graphite will employ telescopic front forks that make riding on bad roads easier. A rear monoshock suspension will be standard. 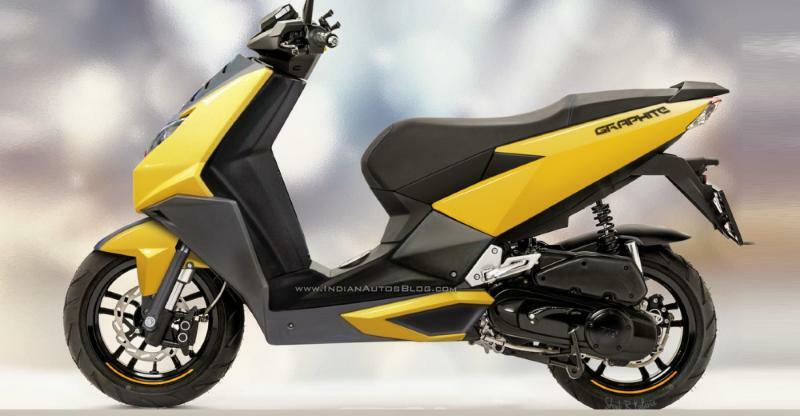 The scooter is also expected to get a rorty exhaust note, something that goes with its sporty positioning. A hydraulic disc brake will handle braking on the front wheel while the rear will get a drum. Tubeless tyres and alloy wheels are likely to be standard. TVS is also expected to offer a mobile phone charging socket. We also hope that the underseat storage is large enough to stow away a full size crash helmet. More details will be revealed on the 5th of February, which is less than 2 weeks away. Stay tuned.